Here we present a protocol for the induction of left ventricular cryoinjury followed by the implantation of a cardiac muscle patch, derived from human iPS-cell cardiomyocytes in a guinea pig model. 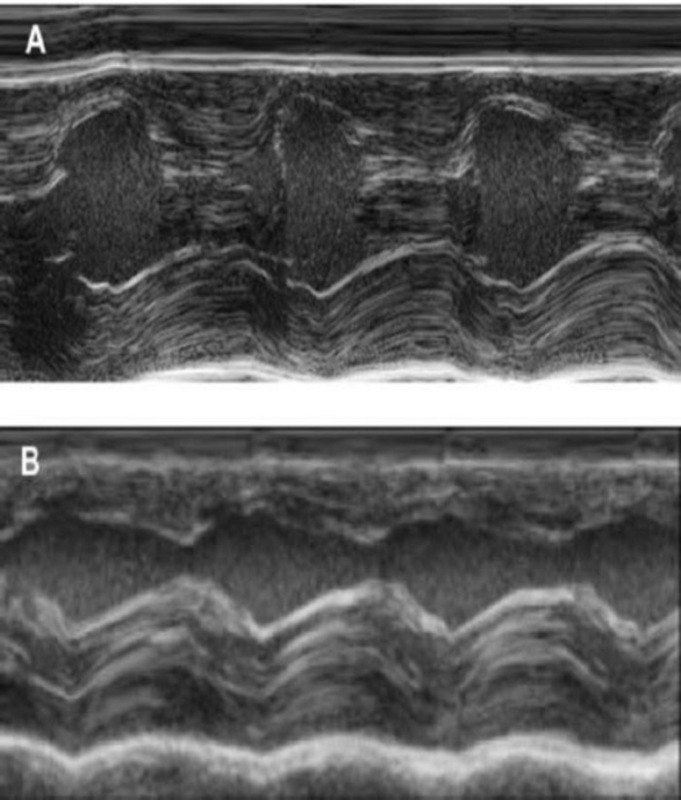 Castro, L., Geertz, B., Reinsch, M., Aksehirlioglu, B., Hansen, A., Eschenhagen, T., Reichenspurner, H., Weinberger, F., Pecha, S. Implantation of hiPSC-derived Cardiac-muscle Patches after Myocardial Injury in a Guinea Pig Model. J. Vis. Exp. (145), e58810, doi:10.3791/58810 (2019). Due to the limited regeneration capacity of the heart in adult mammals, myocardial infarction results in an irreversible loss of cardiomyocytes. This loss of relevant amounts of heart muscle mass can lead to the heart failure. Besides heart transplantation, there is no curative treatment option for the end-stage heart failure. In times of organ donor shortage, organ independent treatment modalities are needed. Left-ventricular assist devices are a promising therapy option, however, especially as destination therapy, limited by its side-effects like stroke, infections and bleedings. In recent years, several cardiac repair strategies including stem cell injection, cardiac progenitors or myocardial tissue engineering have been investigated. Recent improvements in cell biology allow for the differentiation of large amounts of cardiomyocytes derived from human induced pluripotent stem cells (iPSC). One of the cardiac repair strategies currently under evaluation is to transplant artificial heart tissue. Engineered heart tissue (EHT) is a three-dimensional in vitro created cardiomyocyte network, with functional properties of native heart tissue. We have created EHT-patches from hiPSC derived cardiomyocytes. Here we present a protocol for the induction of left ventricular myocardial cryoinjury in a guinea pig, followed by implantation of hiPSC derived EHT on the left ventricular wall. The number of patients with heart failure is increasing in our aging population. For end-stage heart failure, orthotopic heart transplantation is the only curative treatment option. However, especially in European countries, there is an increasing organ donor shortage. Therefore, alternative treatment options are necessary. Recent achievements in mechanical circulatory support are promising, but especially in the long-term run, limited by its side effects like bleeding, pump thrombosis and infectious complications1. The endogenous regeneration capacity of the adult human heart is extremely limited. Therefore, cardiac regeneration therapies might become an alternative treatment option for end-stage heart failure patients2,3. Different techniques including stem cell-based cell injection or tissue engineering approaches have been described3,4,5. Human induced pluripotent stem cells (hiPSC), as well as human embryonic stem cells (hESC) can be effectively differentiated to spontaneously beating human cardiomyocytes6, which has been a major achievement in the field of cardiac regenerative therapies. To replace myocardium after a myocardial infarction and to improve the function of a failing heart, survival of a suitable number of cardiomyocytes and their mechanical and electrical coupling with the native heart is essential. To investigate the potential of cardiac regenerative therapies with human iPS cell derived cardiomyocytes, a suitable research model is needed. The ideal model should be cost-effective and have a human-like physiology and electrophysiology. Large animal models like pigs would be ideal from that point of view, however, those experiments are very expensive and large amounts of cardiomyocytes would be necessary to replace a relevant number of cardiomyocytes in order to see effects on the left ventricular function in a pig infarction model. To answer elementary biological questions towards human cell-based cardiac regeneration, e.g., cell survival, vascularization, and electrical coupling, small animal models are more suitable. From the available small animal models, the guinea pig is the most useful species, as compared to rats and mice, as their electrophysiology more closely resembles the situation in humans7. In this guinea pig model, we induced a transmural cryoinjury of the left ventricle. One week after induction of myocardial infarction implantation of a three-dimensional, spontaneously beating hiPS-cell derived cardiomyocyte patch was performed. Cardiomyocyte cell survival was evaluated 28 days after implantation by histological examination. Animals received humane care in compliance with the Guide for the Principles of Laboratory Animals, prepared by the Institute of Laboratory Animal Resources, and published by the National Institutes of Health. All animal protocols were approved by the responsible local authority (‘‘Amt für Gesundheit und Verbraucherschutz, Hansestadt Hamburg’’/ Animal protocol # 109/16). Commercially obtain female Guinea pigs weighing 500–600 g.
House them under conventional conditions in animal cages. Feed standard rat chow and autoclaved water ad libidum. Place the guinea pig in an induction chamber and anesthetize the animal with isoflurane (2–3%). Check the depth of anesthesia by lack of response to the toe-pinch. Shave and depilate the guinea pig´s thorax using an electric animal hair shaver. Apply prewarmed (~25 °C) ultrasound transducer gel. Use an echocardiography system that is equipped with a transducer frequency higher than 15 MHz. Acquire two-dimensional parasternal long axis views by placing the transducer on the guinea´s pig thorax facing from the right neck towards the left leg and record long axis B-mode images at the plane of the aortic valve with a concurrent visualization of the LV apex. Investigate the pre-operative left-ventricular function. Turn the transducer by 90° degrees to obtain a short axis B-mode view at the mid-papillary level. NOTE: The animal is then immediately transferred to the OR table. The animal is continuously anesthetized with 3% isoflurane. 0.05 mg/kg atropine (i.m.) is injected to avoid increased bronchial secretion during mechanical ventilation. Inject 4–5 mg/kg carprofen and 0.05 mg/kg buprenorphine for analgesia subcutaneously with a 21 G needle and a 10 mL syringe. 0.5 mg/kg Atropine is injected subcutaneously with a 21 G needle and a 10 mL syringe. Place the guinea pig on its back and keep anesthesia with a facemask covering mouth and nose. Check the depth of anesthesia by pinching the hind feet (lack of pedal reflex). Spread the guinea pigs’ legs and fix the position using tape. Shave the chest and the tracheal region of the anesthetized animal with an electric shaver. Disinfect the area widely using iodine-based scrub, followed by 80% ethanol. Repeat this disinfection steps twice. Perform a 1.5 cm vertical incision in the tracheal area and bluntly dissect the muscles covering the trachea until you see the trachea. Puncture the trachea with 18 G i.v. cannula and insert the flexible part of the cannula as a tracheal tube. Connect the tracheal tube to an animal respirator to continuously ventilate the guinea pig during the procedure. NOTE: Now the anesthesia is maintained with isoflurane 3% via the tracheal tube (inspiration assisted ventilation with maximum inspiration pressure, respiration rate: 100–120/min, peak inspiration pressure: 18-22 cm Hg using PEEP-ventilation while the chest is open). Identify the 5th intercostal space by counting the rib spaces beginning at the first intercostal space. Perform a 2 cm horizontal incision on the 5th intercostal space on the left side of the guinea pig using scissors and a tweezer. Insert a small animal retractor. Dissect the muscles with an electrocautery until the intercostal muscles are reached, which can be seen after removing the subcutaneous tissue, are reached. Gently dissect the intercostal muscles with tweezers until the pleural space is reached and one can see the left lung in front. Insert the retractor between the ribs and open it carefully until a good view of the heart is obtained. Open the pericardium approximately 1 cm in the region of the anterior left ventricular wall with scissors. Place a compress on the left lung to protect it from damage when inducing the cryoinjury of the left ventricle. Place the tip of an eroded metal stamp (aluminum) with a cross-sectional diameter of 0.5 cm into liquid nitrogen for 3 min. Press the nitrogen cooled probe onto the left anterior wall of the heart for 30 s. Then separate it from the heart using an electric soldering iron (250 °C) which is placed inside the stamp to warm it up. Repeat this procedure 3 times to obtain a transmural myocardial injury. Observe the blanching of the myocardium. Inflate the lungs with maximum pressure (by clamping the outflow tube of the ventilator for 2 s), to avoid atelectasis of the lung. Remove the retractor from the intercostal space. Close the ribs with two 3-0 sutures. Close the muscles over the ribs with a 4-0 running suture. For closure of the skin use 5-0 suture single stitches. Reduce the isoflurane to 1%. When the animal is breathing spontaneously, remove the tracheal tube, and continue anesthesia with a facemask (isoflurane 2–3%). Assure the absence of reflexes by pinching the hind limb to monitor sufficient depth of anesthesia. Then use a single 8-0 suture to close the puncture site at the trachea. Close the wound with three single stich 4-0 sutures. Use buprenorphine (0.05 mg/kg per 12 h) and carprofen (5 mg/kg per 24 h) for pain medication for the following 5 days. Place the guinea pig in an induction chamber and anesthetize the animal with isoflurane Check the depth of anesthesia by the lack of response to the toe-pinch. Inject 4–5 mg/kg carprofen and 0.05 mg/kg buprenorphine subcutaneously with a 21 G needle and a 10 mL syringe after induction of anesthesia. Place the guinea pig on its back and keep anesthesia with a facemask covering mouth and nose. NOTE: Sufficiency of anesthesia should be checked by pinching the hind feet. Spread the guinea pig’s legs and fix the position using tape. Perform the pre-surgical preparations as described in step 3.1.4–3.1.6. Perform a 2 cm horizontal skin incision in the scar area of the left lateral side using scissors and tweezers. 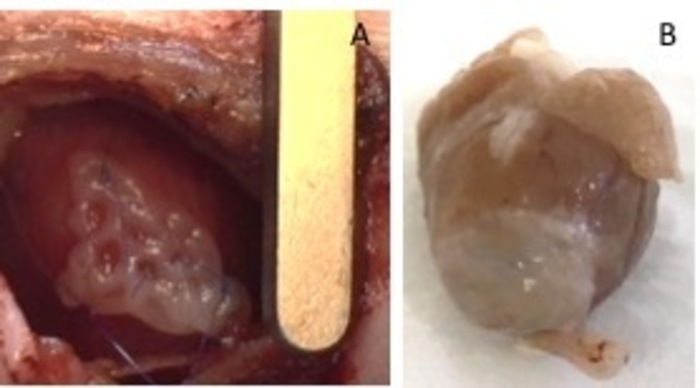 Gently dissect the extrapleural adhesions using an electrocautery. Carefully open the pleural space with scissors. Insert a rib spreader to expose the heart. Visually identify the region of the infarction by its pale color in comparison to the healthy surrounding myocardium. Place the engineered heart tissue patch over the infarction region. Secure it with two 8-0 sutures at both sides. Make sure to secure the patch in the non-infarcted area of the heart (Figure 1). Inflate the lungs with pressure, to avoid atelectasis of the lung. Remove the retractor from the intercostal space. Assure the absence of reflexes by pinching the hind limb to monitor sufficient depth of anesthesia. Then use a single 8-0 suture to close the puncture site at the trachea. Close the wound with three single stitch 4-0 sutures. Four weeks after EHT implantation perform a transthoracic echocardiography (as described in step 2) to monitor LV function over time. Euthanize the animal which IACUC approved protocol and surgically explant the heart for further analysis. This guinea pig model is a suitable model to investigate cardiac regeneration after implantation of hiPSC derived EHT-patches. It reproducibly leads to large transmural myocardial injuries. Scar size is evaluated by histology four weeks after cryoinjury. Mason trichrome staining reveals large transmural scars (Figure 2). Scar size was similar over a large number of injured animals reflecting a high degree of reproducibility8. On average 25% of the left ventricular myocardium was replaced by scar tissue. 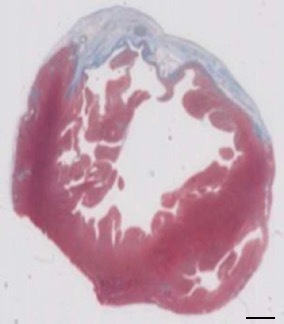 Dystrophin staining demonstrated large myocardial grafts that partially remuscularized the scar (Figure 3a). Staining for human Ku80 proved the human origin of this newly formed myocardium (Figure 3b). Higher magnification revealed that these grafts consisted of densely packed myocytes. Left ventricular function was monitored using transthoracic echocardiography. A successful EHT implantation is characterized by an improvement in LVEF, Fractional area shortening, and a decrease in Left ventricular end-diastolic diameter (Figure 4). Figure 1: hEHT-patches after implantation. (A) Patch immediately after implantation. (B) Patch four weeks after implantation. Please click here to view a larger version of this figure. Figure 2: Determination of infarction on Masson’s trichrome stained paraffin section 28 days after cryoinjury. The infarction is determined by the blue color in Masson’s trichrome staining, representing fibrotic tissue. Scale bar = 2 mm. Please click here to view a larger version of this figure. Figure 3: Staining with Dystrophin and Human Ku80. (A) Dystrophin staining shows large muscle islands (brown) in the scar area (B) Ku-Staining of paraffin sectioned heart. Ku-80 is a human-specific antibody. Therefore, the positively stained cells (brown color) are from human origin. Please click here to view a larger version of this figure. Figure 4: M-Mode measurement of the left ventricle using transthoracic echocardiography. (A) at baseline and (B) one week after cryoinjury. (IVS: Intraventricular septum, LV: Left ventricle, PW: Posterior wall). Measurements are performed 3 times. At baseline, 1 week after cryoinfarction and 4 weeks after EHT implantation Please click here to view a larger version of this figure. A variety of small animal models are available to study the effect that cell transplantation exerts on injured hearts9,10,11. We chose a guinea pig model because of all small animal models its (electro)physiology resembles most closely that of humans. The advantages of small animal models are simple housing, manageable costs, and few workforces. In comparison with mice and rats, guinea pigs´ cardiac (electro)physiology is more similar to humans. In particular heart frequency is lower (~250/min), ventricular action potential shows a plateau phase and the potassium current Ikr is important for repolarization7. Furthermore, the larger size of the animals facilitates surgeries, which is especially important as a re-thoracotomy is required one week after the induction of injury. However, guinea pigs are sensitive to anesthesia requiring some experience. Shiba et al., described the use of 50 mg/kg ketamine and 2 mg/kg xylazine (i.p.) to anesthetize guinea pigs for cardiac cryoinjury4. We have also evaluated this anesthesia regiment. One of the disadvantages is the fact that it is impossible to suspend the narcotic effect of xylazine and ketamine due to missing potent antidotes. Considering that guinea pigs are at high risk of hypoglycemia during surgical procedures, we decided to use a narcotic gas whose effect is easy to control and therefore leading to a very short anesthetic recovery phase. A tracheotomy is used to ensure a safe ventilation throughout the procedure. An oro-tracheal intubation is technically very demanding in guinea pigs, as the visualization of the opening of the trachea is often difficult and a safe intubation cannot be guaranteed. Although cryo-injury induces a severe myocardial injury it does not precisely mirror a coronary artery disease/ myocardial infarction in humans. In this respect, the ligation of the LAD or even an ischemia-reperfusion injury model more closely recapitulates the human pathophysiology. However, the coronary artery anatomy in guinea-pigs is characterized by an extensive collateralization. Therefore, a ligation of the left anterior descending coronary artery does not reproducibly result in large myocardial injuries in guinea pigs12,13. LAD-ligation in mice and rats leads to an extensive remodeling and eventually thinning of the anterior wall, a characteristic that is not seen in humans to this extent. The guinea-pig cryo-injury model induces remodeling processes and thinning of the ventricular wall, but to an extent, that more closely resembles a myocardial injury seen in humans. Therefore, a cryoinjury model resulting in a more reliable myocardial injury was chosen13. Periprocedural mortality is a major problem with this model. Initially, about 30% of the animals died during the first operation or within 7 days after cardiac injury. Another 30% died during EHT implantation accounting for an overall mortality of 60%. Several modifications lead to a significant decrease in mortality. Isoflurane induces heavy salivation and bronchial secretion. Atropine reduces bronchial secretion and was a major factor to decrease mortality. The second factor that heavily decreased mortality is the use of a soldering iron to release the cold metal stamp from the heart. Warm water was initially used to detach the stamp from the myocardium. However, it was difficult to remove the water from the thoracic cavity. Remaining water negatively influenced respiration and lead to the development of adhesion that worsened the animal´s prognosis. Another modification that positively influenced the procedure was the protection of the left lung from the cold metal stamp with a compress. After these modifications were implemented mortality dropped to ~20% for the cardiac injury operation (including the first postoperative week) and another 25 % for EHT transplantation. Induction of cryo injury represents the technically easier operation and consistent results can be achieved after 5-10 animals have been operated under supervision. EHT-transplantation is more demanding and about 20 surgeries under supervision are recommended until reproducible results can be obtained. In the beginning, we used warm saline to rinse the heart and, therefore, detach the frozen probe from the left ventricular wall. This procedure is easier to handle but a few milliliters of saline remain in the thorax increasing the risk of respiratory failure. In conclusion, the depicted guinea pig model is reproducible, inexpensive and leads to consistent results. Transthoracic echocardiography offers a feasible and non-invasive tool to evaluate the presence of cardiac injury before re-operation and graft-implantation is performed. None of the authors has competing financial interests or other conflicts of interest to declare. Kirklin, J. K., et al. Seventh INTERMACS annual report: 15,000 patients and counting. The Journal of heart and lung transplantation: the official publication of the International Society for Heart Transplantation. 34, 1495-1504 (2015). Soonpaa, M. H., Field, L. J. Survey of studies examining mammalian cardiomyocyte DNA synthesis. Circulation research. 83, 15-26 (1998). Shiba, Y., Hauch, K. D., Laflamme, M. A. Cardiac applications for human pluripotent stem cells. Current pharmaceutical design. 15, 2791-2806 (2009). Shiba, Y., et al. Human ES-cell-derived cardiomyocytes electrically couple and suppress arrhythmias in injured hearts. Nature. 489, 322-325 (2012). Chong, J. J., et al. Human embryonic-stem-cell-derived cardiomyocytes regenerate non-human primate hearts. Nature. 510, 273-277 (2014). Kattman, S. J., et al. Stage-specific optimization of activin/nodal and BMP signaling promotes cardiac differentiation of mouse and human pluripotent stem cell lines. Cell stem cell. 8, 228-240 (2011). Watanabe, T., Rautaharju, P. M., McDonald, T. F. Ventricular action potentials, ventricular extracellular potentials, and the ECG of guinea pig. Circulation research. 57, 362-373 (1985). Weinberger, F., et al. Cardiac repair in guinea pigs with human engineered heart tissue from induced pluripotent stem cells. Science translational medicine. 8, 363ra148 (2016). Shiba, Y., et al. Electrical Integration of Human Embryonic Stem Cell-Derived Cardiomyocytes in a Guinea Pig Chronic Infarct Model. Journal of Cardiovascular Pharmacology and Therapy. 19, 368-381 (2014). van Laake, L. W., et al. Human embryonic stem cell-derived cardiomyocytes survive and mature in the mouse heart and transiently improve function after myocardial infarction. Stem cell research. 1, 9-24 (2007). Zimmermann, W. H., et al. Engineered heart tissue grafts improve systolic and diastolic function in infarcted rat hearts. Nature medicine. 12, 452-458 (2006). Johns, T. N., Olson, B. J. Experimental myocardial infarction. I. A method of coronary occlusion in small animals. Annals of surgery. 140, 675-682 (1954). van den Bos, E. J., Mees, B. M., de Waard, M. C., de Crom, R., Duncker, D. J. A novel model of cryoinjury-induced myocardial infarction in the mouse: a comparison with coronary artery ligation. Heart and circulatory physiology. H1291-H1300 (2005).